Along with the VU’s “Waiting For the Man,” Jacques Brel’s “Amsterdam” (and Scott Walker’s interpretation of it) is one of the essential building blocks of Bowie’s development as a songwriter. Diamond Dogs couldn’t exist without it, nor could “Time”; “Amsterdam” was even once slotted to appear on Ziggy Stardust: Bowie wrote “Rock ‘n’ Roll Suicide” in part as his Brel substitute. There’s a spot of confusion as to when the released Bowie studio take of “Amsterdam” was recorded: the reliable Kevin Cann slots it into the Pin Ups sessions of summer 1973, which is possible (that’s when it finally came out, as a B-side) but that seems like a rare error on his part. Unless the “Amsterdam” recorded in 1971 for Ziggy Stardust was a different take from the B-side version? There’s also another studio version circulating (see below) which sounds like a demo. And the version included on Rare is yet another take, of unknown origin: was this the Ziggy take? One day, perhaps, it will all get cleared up. Amsterdam (Bowie, BBC, February 1970). Amsterdam (alternate studio take?, 1971?). Brel never recorded “Amsterdam,” despite it being one of his best-known songs: its only official release is on a 1964 live LP of Brel at the Olympia, in Paris. Bowie first heard “Amsterdam” via Scott Walker’s cover recording, the final track on Walker’s 1967 debut LP. Bowie also attended the stage show Jacques Brel Is Alive and Well and Living in Paris, which, having debuted at the Village Gate in Greenwich Village, had come to London in the summer of 1968. The play had no libretto, just a series of performances of Brel compositions, with Mort Shuman (who also performed in the play) and Eric Blau translating Brel’s lyrics (freely and racily). After performing the song twice for the BBC, Bowie cut a studio take of “Amsterdam” that was issued as a B-side in 1973. Where Walker’s “Amsterdam” had been a reel of accordion, strings and horns, Bowie sang accompanied only by his (and in the studio take, possibly Mick Ronson’s) acoustic guitar. In early live recordings Bowie seemed in awe of the song, but by the studio take and his last live performances, he’d developed a saucy tone for the opening verses, boldly inflating and compressing phrases. Yet when he vied to match Brel and Walker in intensity in the last verse, he still audibly strained for effect. His last apprentice work. Recorded (presumably) autumn 1971. Released 12 October 1973 (RCA 2424). Broadcast on 5 February 1970, The Sunday Show and 21 September 1971, Sounds of the 70s. After retiring “Amsterdam” as a stage piece in 1972, Bowie gave it a very brief revival for the Sound + Vision tour of 1990: its only appearance, I believe, was the aborted attempt in Brussels, linked above. 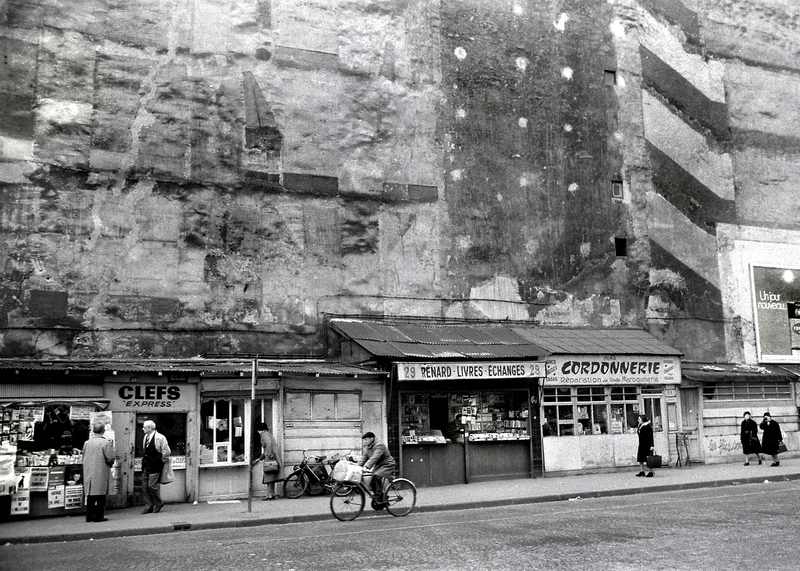 Top: “Renard Livres Echanges, near Les Halles, Paris,” 1970. Amsterdam (David Bowie, BBC, February 1970). Amsterdam (Bowie, studio version 1971). Brel never recorded “Amsterdam,” despite it being one of his best-known songs: its only official release is on a 1964 live LP of Brel at the Olympia, in Paris. Bowie likely first heard “Amsterdam” via Scott Walker’s cover recording, which was the final track on Walker’s 1967 debut LP. Bowie also attended the stage show Jacques Brel Is Alive and Well and Living in Paris, which, having debuted at the Village Gate in Greenwich Village, had come to London in the summer of 1968. The play had no libretto, just a series of performances of Brel compositions, with Mort Shuman (who also performed in the play) and Eric Blau translating Brel’s lyrics (freely and racily). In late 1968 Bowie began covering “Amsterdam” with his folk trio, keeping the song in his stage repertoire until 1972 (he replaced it with Brel’s “My Death,” which better suited the times). Bowie even originally intended to end side 1 of Ziggy Stardust with his studio version of “Amsterdam,” with Side 2’s closing song, “Rock and Roll Suicide,” being a thematic twin of sorts, Bowie’s own rock & roll Brel song. Like “Waiting for the Man,” the other song Bowie obsessively covered in this period, “Amsterdam” offers street life as stage material, but where Lou Reed’s lyric is the narrow perceptions of its junkie narrator, Brel’s “Amsterdam” is sprawling, a Bruegelian vision: a port filled with drunken, paunchy sailors who chew fish heads with their rotten teeth, piss in the street, fight, sing in broken voices and use the port prostitutes “for a few dirty coins.” The sense of life as a canvas, the vulgar proletarians as actors in their own dramas, appealed to Bowie, whose ’60s lyrics had tended to be obscure or bloodless—he sensed a method, via Brel, to connect with reality more directly, to use stagecraft to build more resonant songs. Bowie also took from “Amsterdam” its sense of apocalyptic timing (such as how “Amsterdam” begins quietly, with the port slowly waking up, and builds to a wild, drunken spectacle) and its exacting demands on a singer, who has to deliver the entire lyric without barely a pause in three minutes, the intoned words “in the port of Amsterdam” serving as the unchanging hub of the song. Bowie’s various covers of “Amsterdam” are as much interpretations of Scott Walker’s recording as they are Brel’s. In all his attempts, Bowie seems too much in awe of the material: when he tries to outdo Brel in intensity and Walker in moodiness (particularly in the studio recording) his vocal is stagy and strained, the lyric’s judgments seem unearned. It’s Bowie’s last apprentice work. Bowie first recorded “Amsterdam” for the BBC’s Sunday Show on 5 February 1970 (on Bowie at the Beeb), and also for “Sounds of the ’70s” on 21 September 1971. The studio recording of “Amsterdam,” made in the summer of 1971 during the early Ziggy Stardust sessions, was eventually cut from the LP (though it was on the first master recording) and wound up issued as the B-side of “Sorrow” in 1973.